Many girls, myself included, have straight hair, but now and then we all love to go for a different look. I have always had a slight hair crush on Erin Wasson. She has a seemingly effortless look, like she doesn’t care. Some people call it vacation hair, other people refer to it as mermaid hair or the surfer girl look. For all of us that aren’t Erin Wasson, here’s a guide on how to at least achieve her hair style in five simple steps. For me, creating curls works best on freshly washed hair. Once I washed my hair (more on that ritual here) I give it a gentle towel dry, apply a heat protection spray and finally blow-dry it with a hair dryer on a low heat setting. 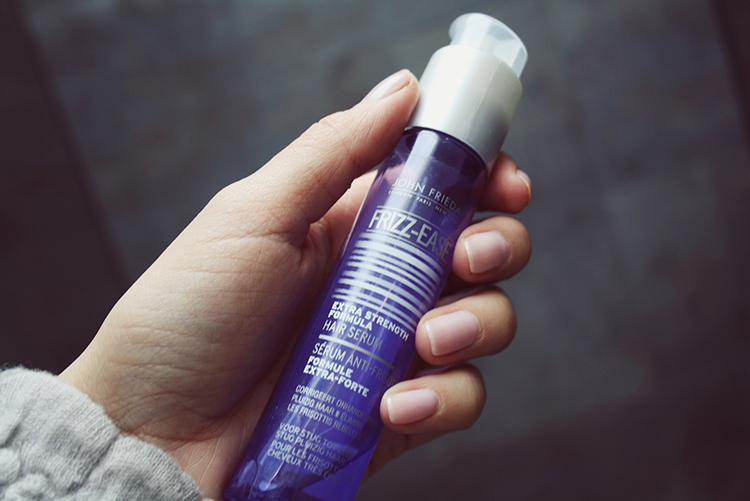 After I’ve prepped my hair, I like to put a bit of John Frieda Frizz Ease hair serum on my fingers and run it through my ends to control the frizz and prevent unwanted tangling. To achieve that wavy, sort of bohemian hair the most important thing is to invest in a great salt spray. Salt sprays work wonders when adding body to your clean hair and give it that beachy texture. Most sprays tent to be sticky, thick or heavy but this fruit scented Original Mineral Surf Bomb sea salt spray is a lightweight spray that gives you texture without killing the shine and it is just ideal for my fine hair. You can easily build up the texture, so I start by lightly misting the product through my mid-lengths and roots until I reach the desired level of surfer girl. I then let it dry out for about 5 minutes and run with my hands trough my hair – please do not a brush, then it might get frizzy and it will ruin that freshly created natural looking texture. The fastest way to create loose beach waves in no time is by using a curling iron – preferably one that doesn’t have a clamp. I love this Remington Ci95 Pearl Wand because it has an adjustable heat setting for all different hair types. I usually heat it at 180° and turn it down to 140° when I’m doing the thinner sections of hair on the side of my face. I simply start by sectioning out my hair into a lower and upper part. To keep the hair out of the way I use a hair clip to secure the upper section on top of my head. Now it’s time to finally create some curls! I keep the wand vertical and pointed down to my head as I wrap a small section of hair around it and hold for about 8 seconds. When I curl the hair around my face I prefer to curl these sections away from my face. 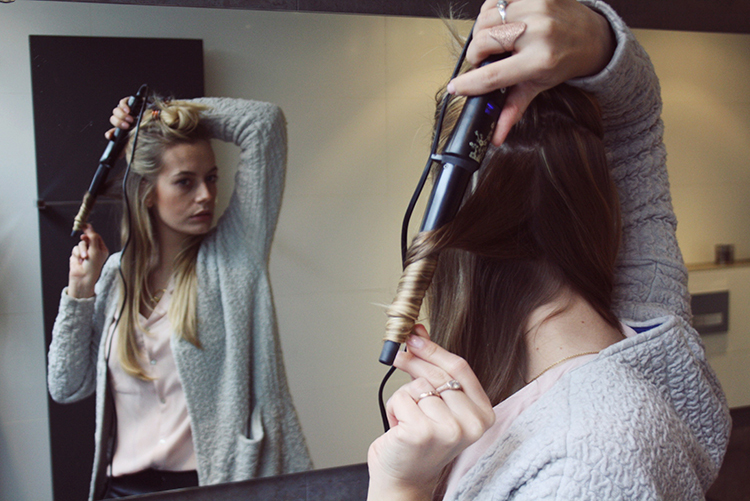 To prevent you from creating a really glamorous curl, be sure to keep around 5 cm/2 inches of your hair away from the wand between your fingertips. Please be careful or you might burn your fingers! Let the curls cool off for about 10 minutes, then gently run your fingers through your hair to break-up your locks and create a looser look. The final step is to create some extra hold. To make sure your waves last longer, use a tiny bit of a fixing spray. I flip my hair upside down and then apply a little of L’Oreal studio silk & gloss fixing spray all over my hair. When done it gives me an instant volume boost after flipping my hair back! I love it that this spray comes out as a fine mist and the price is great! Posted in BeautyTagged 5 steps, Erin wasson hair, john frieda serum, Original Mineral, salt spray, Surf bombBookmark the permalink. Really informative post, would love for you to check out my blog too!